Bierstadt Lake is a short destination hike in Rocky Mountain National Park to a sub-alpine lake with great panoramic views. At Bierstadt Lake, the trail forms a 1 mile loop along its shores, making it a perfect leisurely hike with friends. 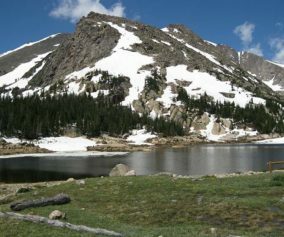 Bierstadt lake can be accessed from several different trailheads with differing terrain and demand. 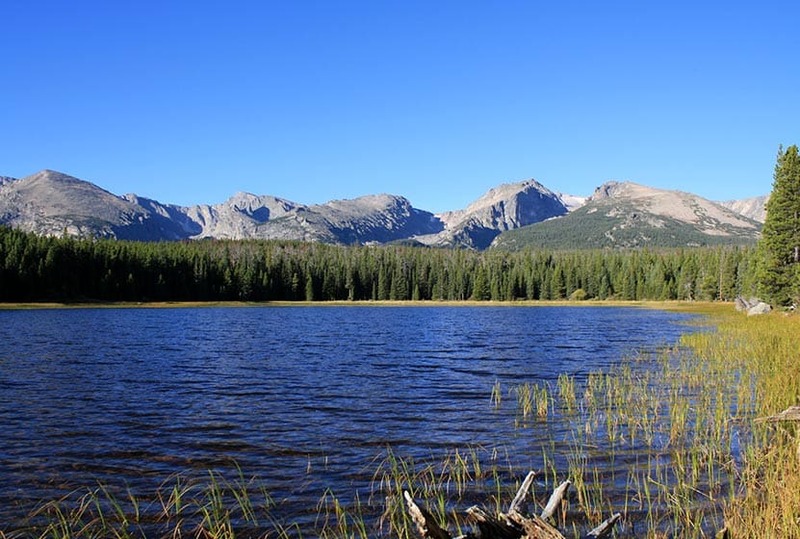 Explore the full Bierstadt Lake hike profile below for trail map, driving directions, and more of the details you need to enjoy this adventure in Rocky Mountain National Park. Bierstadt Lake can be accessed from several trailheads in Rocky Mountain National Park. Driving directions to all of these trailheads are available in the Bierstadt Lake trail snapshot above. 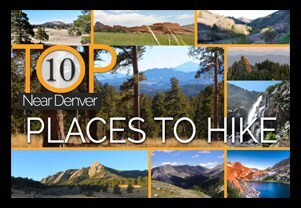 Review the options below to find the best fit for your hiking plans. From the Bierstadt Trailhead: Limited parking and the most difficult route because of the elevation gain traversing Bierstadt Moraine. This route is 1.4 miles to the lake with +566′ elevation gain. From Bear Lake Trailhead: Recommended for those looking for a less demanding hike to Bierstadt Lake. This way is 1.6 miles to the lake with about +255′ elevation gain. From the Park & Ride lot in RMNP: There is a trail on the northwestern edge of the parking lot that leads directly to Bierstadt Lake. 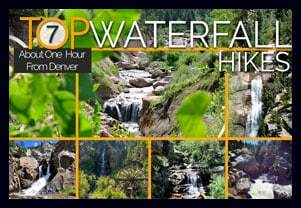 It is approximately 1.5 miles from the parking lot to Bierstadt Lake and a less demanding route than hiking from the Bierstadt Trailhead. 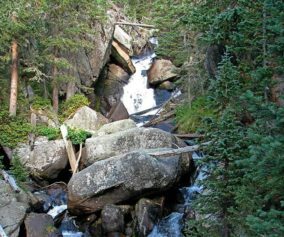 The hike to Bierstadt Lake will be different depending on your starting point. I’ve hiked the trail starting at the Bierstadt Trailhead. It’s demanding. The Bierstadt Moraine will require a lot from your quads. So, if you take this route, be sure to bring some trekking poles. The route from Bear Lake can be accessed by hiking the paved path from the trailhead to Bear Lake, then taking the first right-hand trail, which is the one that leads to Flattop Mountain. 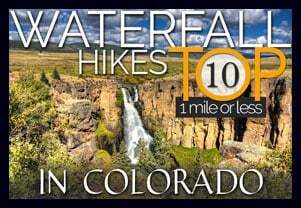 You may be thinking, “Flattop is in the west, and Bierstadt Lake is in the east.” You’re right, and the trail will soon (after approx. 1/2 mile) split. At this first junction, the right-hand path will take you Northeast into the Mill Creek Basin area. 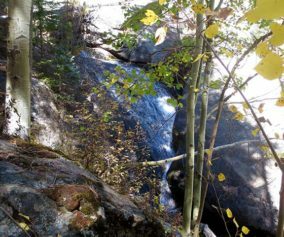 Down in Mill Creek Basin, a spur trail, to the right, will lead to Bierstadt Lake. If you want to make your hike a bit longer, you can pass this spur trail, and hike further through the basin for about another 1/2 mile until you encounter a 2nd spur trail that leads (to the right/east) over to Lake Bierstadt. Hikers can pick a spot to rest and enjoy the sites of the lake, or they can continue around the 1 mile loop trail that encircles it. The best views are from the east side, and are worth the extra distance to take in some incredible views of the Rocky Mountains. TIP: The Bierstadt Lake trailhead has limited parking. You can opt to park at Bear Lake, or the Park & Ride trailhead instead. 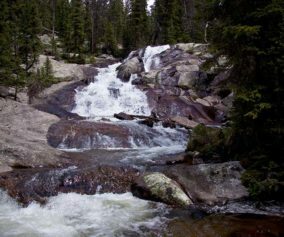 Fishing: Bierstadt Lake is not on the list of fishable lakes in RMNP. Photo: We would like to express our gratitude to Chris for sharing such an amazing photograph of this hike to Bierstadt Lake in RMNP.